Take Out Orders Now Available. A BREAKFAST JOINT… GOOD MORNING! There’s nothing better than starting your day with fresh ingredients, delicious meals & don’t forget our warm & friendly staff! 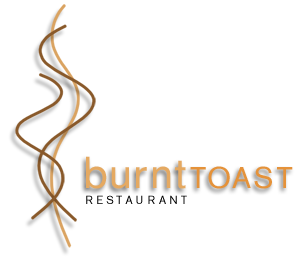 At Burnt Toast Restaurants, we believe there is nothing more important than the perfect breakfast from comfort food and healthy choices to our classic meals! Don’t forget our very own Burnt Toast blend of freshly ground coffee! Nothing screams lunch more than our creative menu! Indulge in our delicious salads, gourmet burgers, savory sandwiches & our popular homemade soups! At Burnt Toast Restaurants we have something for everyone, that includes the right meal for even the pickiest of eaters. From chicken strips to french toast sticks, we know you’ll find something just for them! Our customers don't care how much we know, until they know how much we care! 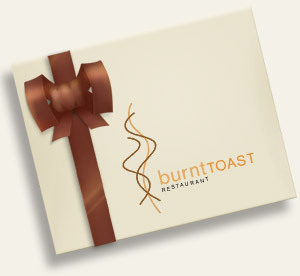 Gift cards can be purchased at both Elgin and Algonquin Burnt Toast Restaurants. They're the perfect gift for family and friends, employees, co-workers and associates. Thank you for understanding that Burnt Toast Restaurants do not take reservations. we work to get you seated as quickly as possible!